 Our Process - Classic Remodeling NW, Inc.
From the beginning estimate to project completion, at Classic Remodeling NW Inc. you can expect transparency and attention to detail throughout your project. After many years of custom home remodeling we have crafted a process that we are proud of. So what can you expect from Classic Remodeling NW Inc. from our estimates or when you start a construction project? To be on time to every meeting or receive a phone call at least 15 minutes before the scheduled appointment to let you know when you can expect them to arrive. To be fully heard and listened to in every meeting. (Two ears – One mouth). To have all of your questions answered to your satisfaction…in the beginning. Timely delivery of your estimate. A complete and detailed estimate explaining everything that Classic Remodeling NW, Inc. is going to do and all that is expected of you, the home owner. A complete and detailed set of construction drawings (if needed). A pre-construction meeting to go over all aspects of the project to make sure all parties are on the same page. A clean and organized job site every day. We have the construction area sealed off from the remainder of the home by plastic or other means. You are to be kept informed on a daily basis of the progress of the project. All of your questions will be answered in a timely manner. You receive a project schedule detailing when Classic Remodeling NW and subcontractors will start and finish their project. A weekly project meeting to go over what happened the past week and what is expected to happen the next week. You receive a lien release notice from our company and all subcontractors who work on your project.